We’re proud of the many new and improved resources we’ve made available to our students, including the renovated library -- hopefully many of you have had the chance to enjoy it during your studies! So we were excited when the General Building Contractors Association (GBCA) recognized our efforts and awarded Peirce first place in the 2011 Best Industrial/Institutional Project under $5 million category for the library renovations. In case you didn’t know, we are actually two-time award winners in this category. We won in 2001 for the Alumni Hall renovations. I’d like to thank everyone who was involved in the project. Without your input and hard work, this would not have been possible! Read on below for more details about the renovations and resources that made this a winning project. 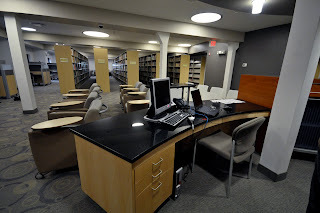 And be sure to stop by the library to check out the new space! PHILADELPHIA--(November 14, 2011)-- Peirce College won first place in the 2011 Best Industrial/Institutional Project Under $5 Million category for the College’s library renovations at the General Building Contractors Association (GBCA) awards ceremony, held in Philadelphia on Monday, Nov. 14. Peirce prevailed over some tough competition, including the University of Pennsylvania and Drexel University, which were nominated in the same category. The architect for the renovations for College Hall’s Viola Gill Guté Library -- named for an alumna from the class of 1917 -- was Phillip D. Kunz Architects, Inc. of Collingswood, N.J. Haverstick‐Borthwick Company of Plymouth Meeting, Pa. was the general contractor. This is the second time Peirce received an award from GBCA. The College previously won in 2001 for its Alumni Hall renovations. The project was managed by Vito R. Chimenti, Chief Auxiliary Services Officer for Peirce College. Much of the furniture in the library is on wheels, providing mobility and greater flexibility for the students. Part of Peirce’s campus, College Hall, is a seven‐story classroom building on the corner of Carlisle and Pine Streets. The seven-story building originally housed all of the college’s functions prior to its expansion in the late 1990s. At that time, the college renovated five adjacent historic row homes, which added much needed office space and additional student support areas. Then, in 2006, the College began the systematic renovations of each floor of College Hall. The goal was to update each floor over the summer breaks until all of College Hall was renovated. 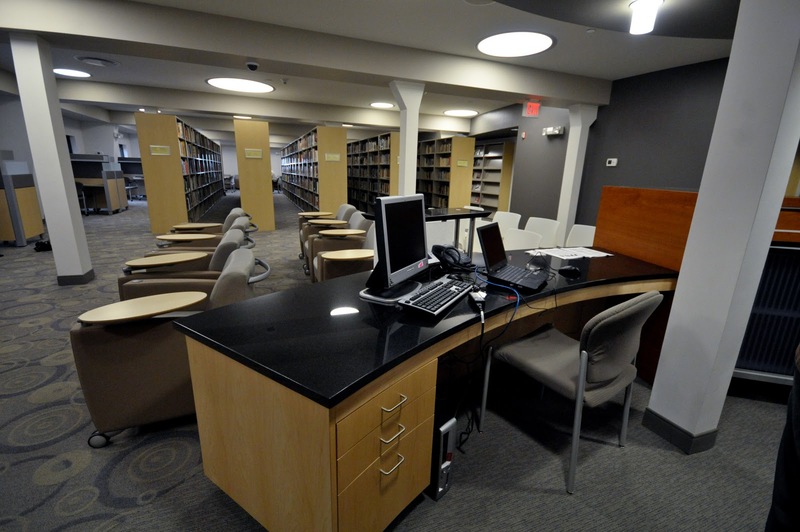 The renovation of the existing 6,090-square-foot library, located on the seventh floor, was the fifth part of this multi-phase project. Design of the library began in 2009, construction started in May 2010, and the library opened in late summer for the 2010 school year. When the building was first constructed, the seventh floor was a mezzanine running track around the perimeter of the building, open to the sixth floor gym below. The 2011 Construction Excellence Awards judges stated that, "This was an exemplary project. It was an extremely intricate design and was well executed. This project was selected for the difficulty in construction and the challenges in working with multiple materials." According to Walter P. Palmer III, President & CEO General Building Contractors Association, "This is the second time the team of Peirce College and Haverstick-Borthwick have teamed up to create a winning project. Back in 2001, Peirce College and Haverstick-Borthwick won for Alumni Hall, and this week we celebrated their award-winning partnership with the Best Industrial/Institutional Project Under $5 Million. I am glad to see that owners and contractors working together on complex projects and achieving such positive results." The GBCA, the Philadelphia Builders’ Chapter of the Associated General Contractors of America, dates back to the early 1700s, and is one of the oldest trade associations in America, serving a membership in the Philadelphia five county area of Montgomery, Bucks, Delaware, Chester, and Philadelphia.